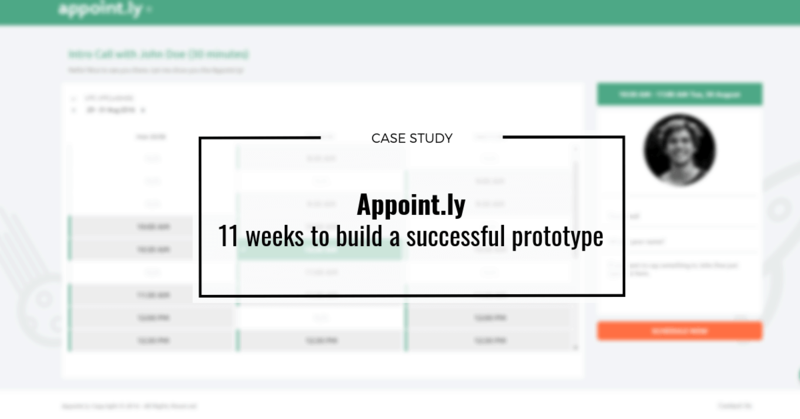 The story behind Appoint.ly’s development goes back to 2016 when we encountered issues with easy, one-step appointment scheduling and identified the problem. Back then, meeting scheduling looked way different than it does today. The market suffered from the scarcity of all-in-one, useful, and easy to navigate solutions that could save time and hassle when planning meetings. The available tools were either hard to set up or they missed some important functions. Appoint.ly is a web-based appointment scheduling tool with a free plan covering basic needs and a Pro plan for more demanding users. The app is fully integrated with the Google calendar but cooperates with other popular scheduling tools as well. Currently, it is used worldwide, also by the US Ivy League professors and other people who value their time. Appoint.ly’s development started after a thorough market research and surveying target customers. Further steps were organized into a by-the-book process – all that in order to achieve the prototype that we could show to the public. The actual prototype was finished successfully within 11 weeks of work. Efficient development and market introduction were possible due to applying Saas Manager solutions that sped up the process, especially in regard to the account, payments, and customer management. Appoint.ly’s most remarkable features include calendar integration, time zone synchronization, and ease, both in booking the meeting and sharing your personal link with others to choose from your free time slots. Although the environment is ready to implement other languages, research conducted within the target after publishing the English version showed that no other version is currently required. We collaborated on this project within a team of 6, including 4 developers, a project manager, and a product owner. The development of the app included combining several technologies, such as Java, Spring Boot, independent scalable microservices and Docker as a container for those services, MongoDB database, RabbitMQ queues, Amazon SES mailing services, and Braintree payments. In order to create interactive components for the web-based application interface, our developers built the frontend in Angular. Right now, Appoint.ly has 14000 registered users and user growth rate of approx. 300 monthly. The app’s popularity grew mostly due to content marketing and Quora-based answers, leading users directly to the website. Moreover, using Brand24 to identify potential customers helped to omit actual outbound marketing. Appoint.ly is a quintessential example of how Neoteric works: delivering products, not projects. This app taught the team how to independently build products from scratch and understand the challenges our customers face when developing their apps. It also turned the idea-based application development upside down.